While there may be soaring expectations for football head coach Charlie Strong, his predecessors can attest to the challenges — both on and off the field — of being a first-year head coach in Austin. Since 1950, six Texas coaches have made their Longhorn coaching debuts, featuring a 67.6 winning percentage in their first years. In comparison, former head coach Mack Brown went 9-3 in his first season, but stepped down in December after three seasons in which the program produced a 62-percent winning percentage. “When you’re a top program in the country, you have to be about championships,” Strong said at a Jan. 15 press conference. 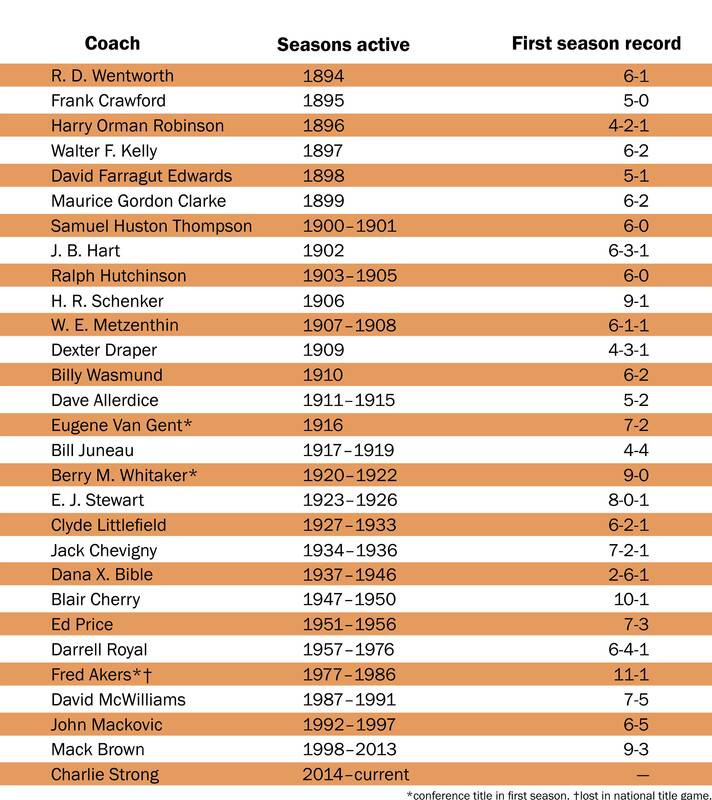 Only three of Texas’ 28 previous head coaches won a conference championship in their first season: Eugene Van Gent in 1916, Berry M. Whitaker in 1920 and Fred Akers in 1977. Akers’ team finished 11-0 in the regular season and fell just short of a national title with a loss to Notre Dame in the Cotton Bowl. But even his fruitful first campaign was preceded by challenges, namely the off-field politics of the sport. Although serving nine years on popular head coach Darrell Royal’s staff eased the transition to Austin for Akers, his hire still drew criticism from many alumni and former players who wanted long-time Royal assistant coach Mike Campbell to take over and disagreed with Akers’ elimination of the wishbone system in favor of the ‘I’ formation and single-back sets. “I was a young guy who didn’t fully understand some of the politics and some of the pressures that come with hailing an icon as a head football coach, Darrell Royal, and I had to learn to deal with that,” Akers said. Strong will face a similar situation as he attempts to build upon Brown’s legacy while juggling the needed changes to the program. He has met resistance already in his first month on the job — notably, Texas billionaire patron Red McCombs calling Strong’s hire a “kick in the face” because he and a few other boosters were not involved in the selection process. McCombs later apologized to Strong for the comment. It is a pressure-packed, push-pull atmosphere that dominates the football environment at Texas. The Longhorns had a $165.7 million operating revenue for 2012-2013, the highest in college athletics. This creates financial flexibility and donors with hefty influence. David McWilliams, former Texas coach and current UT associate athletic director, says the school features the most passionate fan base in America, but that comes with a caveat for coaches. McWilliams, like Akers, was a long-time assistant coach at Texas before ascending to the head role in 1987 after one season at Texas Tech. He was accustomed to the responsibilities placed upon coaches at Texas, but says they could be a bit overwhelming at times, between recruiting, coaching and alumni demands. “You would like for there to be more hours in the day because you can certainly use them,” McWilliams said. Free time has proven to be fleeting for Strong in his first month with the Longhorns. He described his first nine days on the job as being “pulled in different directions,” and, between recruiting, personnel and speaking engagements, Strong has not exactly had time to meditate on the position. Nonetheless, Strong is considerably more comfortable at Texas because of his experience at Louisville. 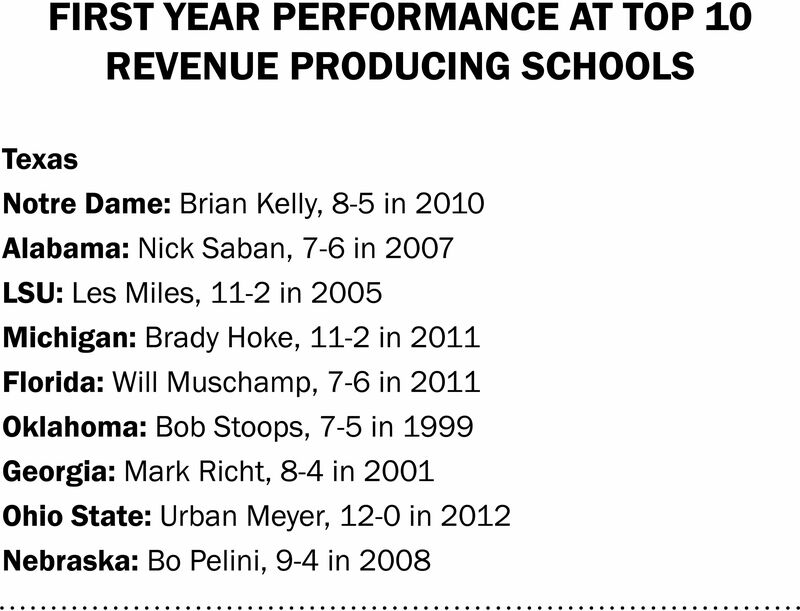 This number is greatly boosted by Urban Meyer’s 12-0 campaign at Ohio State in 2012 and Brady Hoke’s 11-2 season with Michigan in 2011, but Florida’s Will Muschamp had a much more reserved 7-6 record at Florida in 2011, as did Notre Dame’s Brian Kelly when he finished 8-5 the year prior. Perhaps the most notable example comes from Nick Saban, who went a pedestrian 7-6 at Alabama in 2007 before reeling off three national championships over the next six seasons. Despite the mixed history of early success, championships, as Strong stated, will still be the expectation. It is a perilous environment, which McWilliams says can be navigated with patience. Akers says he did not start to feel the pressure of winning at Texas until his seventh year. He credits that to being familiar with the environment in Austin, but he also admits that early wins, which helped establish a strong support system, played a significant role in his level of comfort. Sasan Rezaie, the man behind the voice of the Perry-Casteñeda Library, was born and raised in Iran before obtaining his mathematics degree at UT. Sasan Rezaie may be an unfamiliar name to many, but Rezaie has literally become the voice of the Perry-Casteñeda Library. “The checkout desk will close at 11:45 p.m.” Yes, Rezaie is that guy. However, do not be fooled by his grave demeanor. In person, Rezaie is one of the kindest individuals one could ever meet. Hidden behind small-framed glasses, Rezaie’s eyes are steady and attentive. At the mention of his UT celebrity status, his smile widens in both disbelief and flattery. And regardless of his “salt-and-pepper” hair, Rezaie has a youthful vigor that only adds to his charming persona. Rezaie has since become one of the PCL’s library assistants, making announcements and helping take care of the building. Rezaie has seen UT change significantly since his arrival in the early ‘80s. He reminisced about when he could park right outside the PCL when Fred Akers was head coach of the Longhorns football team and when cars drove freely through campus. His eyes lit up: “On Sept. 10, I will have been here for 32 years.” The epiphany hits him hard and he begins to laugh, pointing at his salt-and-pepper hair. Granted, he has had some bad experiences. His voice becomes solemn as he remembers a student who visited him regularly but died in the early 1990s. He has also witnessed some wild moments. During one of his midnight shifts at the PCL, Rezaie saw a group of students streaking at the library entrance. When Rezaie is not at the PCL, he likes to indulge in Persian and Chinese cuisine. “Alborz Persian Cuisine and First Chinese BBQ are restaurants I enjoy,” Rezaie said. He also likes playing chess and reading novels by author and U.S. talk radio host Clark Howard. COLLEGE STATION — For 10 games, Rick McIvor watched. He practiced, he worked and he was more or less ignored. While Todd Dodge and Rob Moerschell were taking turns saving each other, McIvor only played obvious passing situations. Everyone go long. Rick McIvor — instant offense. The strategy worked once, an 80-yard touchown to Kelvin Epps against Auburn. It failed miserably another time. McIvor provided the instant offense for TCU when his only pass of the game was picked off and returned 66 yards for a touchdown. In Texas’ 45-13 nuking of Texas A&M before a record crowd of 76,751 at Kyle Field, McIvor didn’t have any troubling handling the Aggies. With Texas trailing 13-0 and its offense choking in its own cloud of dust, McIvor entered the game and administered CPR. Less than 15 minutes of playing time later, the Longhorns had scored all 45 of their points. The win clinched the 11-0 Longhorns’ 17th outright Southwest Conference title and their 22nd overall. It was the Longhorns’ third consecutive victory over the Aggies, whose record fell to 5-5-1. The day was a vindication of sorts for McIvor. As the Longhorns worked out in preparation for their opening game with Auburn, McIvor was battling Moerschell and Dodge for the starting quarterback position. But McIvor, who missed fall workouts with scholastic problems, was further set back when he suffered a turf burn on his elbow and wrist and an infection set in. He missed 10 days of practice. As a result, when Dodge, the announced starter for the season opener, separated his shoulder, Akers called on Moerschell to start the game. McIvor spent most of the season on the bench. Going into the A&M game, he had thrown just 12 passes all season and completed just three for 105 yards and one touchdown. During the A&M game, he completed eight-of-12 passes for 170 yards and four touchdowns as the Longhorn offense set season highs for total offense (445 yards), passing offense (258 yards) and pass completions (12). Despite a 10-0 record, a probable Heisman Trophy winner in the backfield and perhaps the coach of the year on the sidelines, Texas puts the entire season on the line Saturday in a crucial battle with Texas A&M in College Station. Earl Campbell, Texas’ all-everything running back, whom Aggie head coach Emory Bellard said “is as good as anybody that has ever played college football,” thinks the game will be very tenacious. “There’s some big people out there, but I think we’ll pull it out all right,” he said. The Aggies, highly regarded across the nation, ranked 11th by UPI this week, are led by fullback George Woodard, who weighs in at 265 pounds, down from 285 after a monthlong diet, and placekicker Tony Franklin. Curtis Dickey and David Brothers complement Woodard with tremendous speed in the backfield while senior quarterback David Walker provides the guidance. Absent from last Saturday’s 52-23 mauling of TCU, Walker will be 100 percent for this week’s 1:30 p.m. kickoff, recovering from minor bruises, coach Bellard said. The Aggies set a Southwest Conference record in total offense against the weak Horned Frogs, amassing 687 yards. McMichael, who tilts the scales at 235, is not accustomed to tackling people heavier than himself. “I’ll have to get my feet planted and hit him right. I’m just looking at him like any other back,” McMichael said. The last time a Texas football team lost three straight to the Aggies was in 1910 after two shutouts in 1909. Texas A&M would like nothing better than to update that statistic, and with a 7-2 record overall this season, 6-1 in conference, “we’re still in contention,” Bellard said. A 41-3 passing at the hands of Michigan on national television and a heartbreaking loss to Arkansas are the only blemishes on the Aggie record. Last week, after the TCU victory, the Aggies accepted a bid from the Bluebonnet Bowl, for if they do not got to the Cotton Bowl. Putting the Cotton Bowl out of the picture, at least for this week, Akers said Tuesday’s practice was one of the best of the year.